Note that this document describes release version numbers for the HDF5 Library. A version number might also include some text. The two current possibilities are patch and snap. A patch version might be made to a released version to make available a feature or a bug fix. 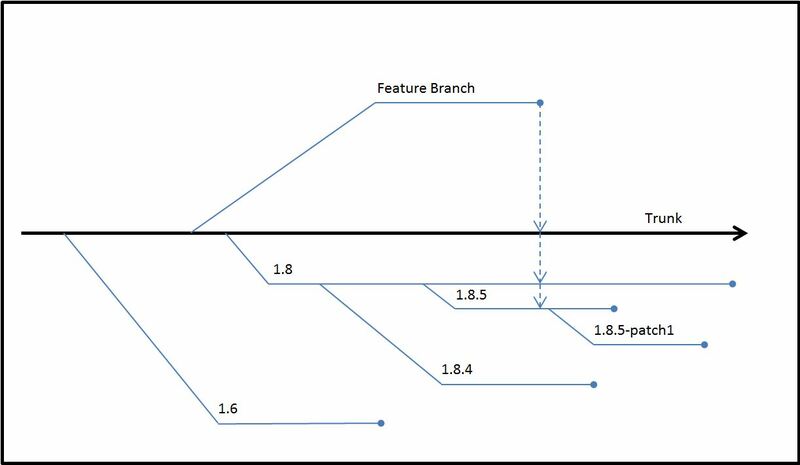 In the figure below, a patch to the 1.8.5 release is labeled 1.8.5-patch1. A snapshot is an intermediate posting of the software in a branch or in the trunk. Snapshots are made available so that users may begin to test changes in the software that affect their software. The changes may range from bug fixes to new features. Snapshots are made and released regularly. How regularly depends on whether the software passes the tests done on each build. A possible version number for a snapshot might be 1.9-snap81. This version would hold the 81st snapshot off the 1.9 development branch (the current trunk). As we improve any branch, we consider the effect of any change on the readability of objects. Applications built, for example, with version 1.8.5 will be able to read data files written with any prior version of the library. So, a 1.8.5 application will be able to read a dataset written with 1.4.5. A 1.8.5 application may be able to read a dataset written under the 1.8.7 library if no new features, features not known to 1.8.5, were used. For more information, see the discussion of backward and forward compatibility in the knowledge base. H5_VERSION_GE and H5_VERSION_LE These macros compare the version of the HDF5 library being used against the version number specified in the parameters. At compile time, they can be used to conditionally include or exclude code based on the library’s version. For more information on these and other function calls and macros, see the HDF5 Reference Manual. The H5_VERSION_GE and H5_VERSION_LE version macros compare the version of the HDF5 Library being used against the version number specified in the parameters. At compile time, they can be used to conditionally include or exclude code based on the library’s version. For example, the link functions, H5Lxxx, are new in version 1.8, and some group functions, H5Gxxx, are deprecated in 1.8. With the H5_VERSION_GE macro, an application could use H5Ldelete if the library version is 1.8.0 or greater, or it could use H5Gunlink if the library version is less than 1.8.0.